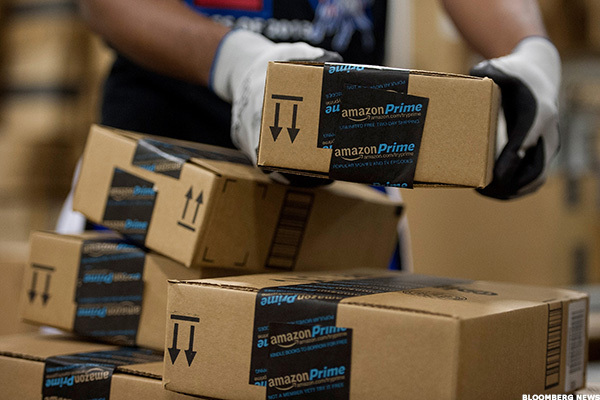 Amazon Prime subscriptions rocketed in the third quarter, positioning Amazon to easily win the holiday shopping season. Amazon.com Inc. (AMZN - Get Report) posted third quarter revenue, earnings and operating income that easily topped analyst expectations on Thursday. But robust growth in its Amazon Prime subscriptions is what should send a shiver down the spine of other retailers gearing up for the holiday shopping rush. Amazon's Prime subscription growth rate grew to 59% in the third quarter from 53% in the second quarter. The boost was driven by strong sign-ups during the e-commerce giant's Prime Day in July, monthly subscription increases and international growth, said Needham analysts on Friday. According to a recent estimate from Consumer Intelligence Research Partners, Prime membership in the U.S. reached 90 million people the third quarter, up from 85 million in the second quarter. Needham said it estimates global Prime membership is somewhere near 110 million people, meaning roughly 20 million Prime subscribers are located outside the U.S. There's nothing quite like Prime, which offers users free two-day shipping and access to videos, music and television shows plus sundry other benefits throughout the year. Without a direct competitor, Amazon Prime has easily become Amazon's secret weapon in winning the retail war. Of immediate concern this holiday season is Costco Wholesale Corp. (COST - Get Report) . A great deal of its members are also Prime subscribers, something that has Costco increasingly concerned -- if assessing comments on earnings calls is any indication. If you can get the cranberry sauce, Christmas jammies and toys for the kids on Amazon in just two days, what's the point of leaving the house to head to Costco for bulk gravy?